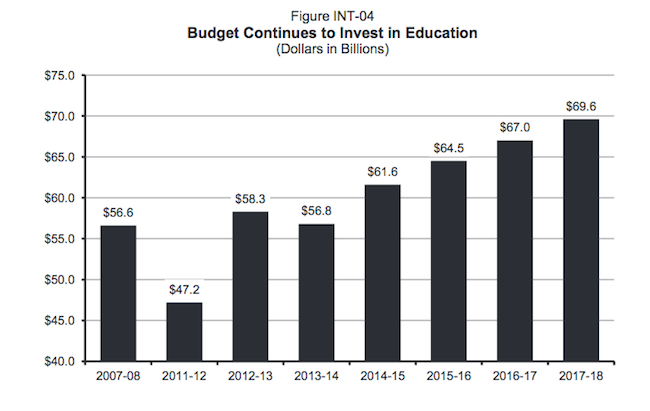 To even out the boom-and-bust revenue cycles that can particularly destabilize education funding, Gov. Jerry Brown is proposing a separate reserve for K-12 schools and community colleges in his revised plan for a rainy day fund.But that lock box for education would gather dust most years because of the tight restrictions that Brown is proposing, according to analysts who have looked at the proposal. It would likely be the end of the decade before one of the preconditions for making an initial deposit is met, and even then, the rules for diverting money from Proposition 98, the main source of funding for schools, would be restrictive. Funding for K-12 schools and community colleges under Proposition 98 fell from $56.6 billion in 2007-08 to $47.2 billion in 2011-12. Gov. Brown says socking away some of the money from capital gains tax receipts in fat years would even out peaks and valleys in the future. Source: Summary of Governor’s 2014-15 Budget. Had Brown’s plan for a reserve been in effect since Prop. 98 was adopted 25 years ago, it could have been activated only once, in 2012-13. There would have been no money put into a reserve in the years leading up to the Great Recession, when Prop. 98 funding fell from $56.6 billion in 2007-08 to $47.2 billion in 2011-12. (The rules for filling Brown’s proposed separate General Fund rainy day reserve would not be as tight, and the Legislature could tap it to help stabilize Prop. 98 funding in a recession, budget analysts said. )But the Brown administration points to a more recent trend to justify why a separate education reserve will be both relevant and important. Revenues from the state’s progressive income tax have become less predictable and more unstable amid rising income disparities. 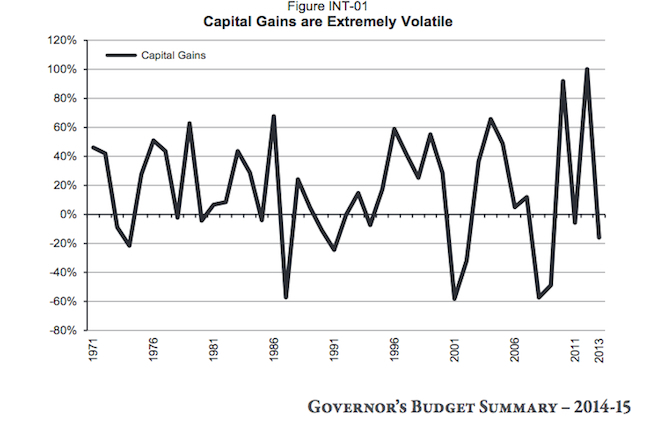 At the same time, the state has relied increasingly on capital gains tax receipts. Just as climate scientists are predicting cycles of more frequent, devastating hurricanes from global warming, the Department of Finance is warning that a heavier reliance on capital gains taxes could lead to bigger gyrations in state revenues and less certainty in budgeting.Brown wrote in his January budget summary that instability is the downside of relying on taxes from the wealthiest residents. But he then noted, “Instead of shifting the overall tax burden to be less progressive, a preferred option is to better manage the revenue spikes.” He believes that a Prop. 98 reserve, even if not used often, will be part of the solution to moderate the impact on schools. With his latest proposal, Assembly Constitutional Amendment X-2 1 (ACA X-2 1), Brown wants the Legislature to amend a proposed rainy day fund on the November ballot. That measure, ACA 4, would strengthen a weak rainy day fund that voters approved in 2004. It’s far from certain that two-thirds of the Legislature, including a few Republicans, will agree to amend ACA 4 as Brown wants. But last week, lawmakers did agree to take up Brown’s request. The Assembly Budget Committee plans a hearing on it Monday.The current rainy day fund requires that the Legislature set aside 3 percent of the General Fund annually until reaching $8 billion or 5 percent of the General Fund, whichever is greater. There’s no limit on how much the Legislature can take out of the rainy day fund, and the governor can suspend or reduce contributions. The state made contributions for two years, then used it up when the recession hit. Governors have suspended payments to it annually for the past seven years. The graph shows the fluctuations in state capital gains tax revenue, as indicated by the percent above or below average annual receipts. The variations have become more pronounced since 2000. Source: Summary of Governor’s 2014-15 Budget. ACA 4 would increase the reserve to 10 percent of the General Fund and would allow no more than half of the fund to be depleted in any year. It also would allow using some of the payments to pay down infrastructure bonds.Brown’s plan would make several significant changes to ACA 4. The most important would be using above-average receipts from the capital gains tax as the sole trigger for depositing money into both the general rainy day fund and the new Prop. 98 reserve. ACA 4 would determine contributions using a complex formula based on historical revenue trends.Brown’s alternative would also allow money that would otherwise go into the reserve to be used to pay off liabilities that make up what Brown calls the state’s “wall of debt.” And it would require the governor to declare a fiscal emergency to dip into the reserve. Past shortages in Prop. 98 funding have been paid off. This funding IOU is called the Prop. 98 maintenance factor; it accumulates whenever a year-to-year funding increase does not cover the growth in student enrollment and the growth in per capita state income. The maintenance factor is currently $7 billion, and the Legislative Analyst is predicting that it won’t be paid off until after 2019-20. This restriction acknowledges that school districts are still struggling to get back to pre-recession funding levels and should be made whole before the state puts any money aside in a K-12 reserve. However, repayment of future Prop. 98 IOUs would not be a prerequisite for money to be deposited in the Prop. 98 reserve. That’s a concern of school districts as they consider the long-term impact of the proposal. There’s sufficient funding to meet that year’s full Prop. 98 obligation, including mandated cost increases. The Legislature has not suspended its requirement to fund the Prop. 98 obligation that year, which it has the authority to do with a two-thirds vote. Proposition 98 funding is in what is called a “Test 1 year.” This is the big catch, because it has happened only twice between 1990-91 and 2013-14. Under Test 1, which occurs when state revenues plummet or surge, K-12 schools and community colleges are guaranteed about 40 percent of the state General Fund. Money would not be deposited in the Prop. 98 reserve in a Test 1 year when revenues fall; that happened in 2011-12. But theoretically there would have been a deposit in 2012-13, when Prop. 98 revenues soared following the passage of temporary increases in the sales and income taxes under Proposition 30. Creating a reserve would not change the rules for determining the annual Prop. 98 obligation; it would affect when schools get some of the money. Brown is projecting that a surge in capital gains taxes will push Prop. 98 into Test 1 again in 2014-15, and the Department of Finance believes Test 1 will be more prevalent in the future. That’s why the governor wants to set in place a Prop. 98 reserve, tied to capital gains tax receipts and linked to Test 1 years.“You would expect, with a more progressive state tax structure and the continued growth in the share of income going to the top of the income scale, we would continue to hit Test 1 in the future,” H.D. Palmer, spokesman for the Department of Finance, wrote in an email.Education groups have reacted coolly to a separate reserve for Prop. 98 while praising the governor’s intent to stabilize the state’s finances.Naj Alikhan, spokesman for the Association of California School Administrators, agreed that a rainy day fund is good for state-level appropriations but said that “districts already are required to keep a reserve and so we are not sure why two are necessary.” He added, “We believe (the proposed reserve) erodes the integrity of Prop. 98. 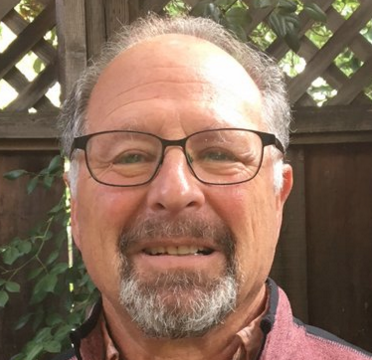 This reserve would either act like a deferral or a suspension of Prop 98.”Vernon Billy, executive director of the California School Boards Association, said the concept of Brown’s plan makes sense long term but that a Prop. 98 reserve would “send a confusing message to the public.” At the same time that education advocates are saying that schools are underfunded in California, hundreds of millions of dollars that districts urgently need would be put aside.Billy also said that Brown has already demonstrated that governors can manage finances efficiently in high-revenue years without making long-term spending commitments or putting money into reserves. He did this with one-time appropriations in the current year: $1.25 billion for implementing the Common Core state standards and $250 million for creating career education partnerships.Rick Simpson, deputy chief of staff for Assembly Speaker John Pérez, agreed with Billy, saying “I’m not sure if the case has been made that we need it.” Proposition 98 was established to guarantee a minimum level of funding each year for schools, not a maximum. Diverting money into a reserve in good years implies that Prop. 98 funding is sufficient, “that it is not a floor but a ceiling,” Simpson said. “In several years, when temporary taxes expire and revenues begin to tail off, the voters could look at money in a reserve and conclude, ‘Why do you need more money if you already have more dough?’”Edgar Cabral, principal fiscal and policy analyst for the Legislative Analyst’s Office, said the office has concerns with the mechanics of the rainy day proposal, which, he said, would add a new set of formulas to an already complicated financing system. He said it is especially risky to predict capital gains taxes, based on projected stock market returns, a year ahead. The actual capital gains tax receipts won’t be determined until more than a year later, requiring “settle-up” calculations after the state budget has already been spent. Since Brown is proposing restrictions that would limit the utility of a Prop. 98 reserve, he asked, “Is it worth the benefit for a lot more complexity?”John Fensterwald covers education policy. Contact him at jfensterwald@edsource.org and follow him on Twitter @jfenster. Sign up here for a no-cost online subscription to EdSource Today for reports from the largest education reporting team in California. I spent yesterday in Sacramento with intelligent, thoughtful staffers who thought the cut in vehicle license fees was the single worst fiscal decision in decades — cutting a stable, broad-based local revenue source and throwing the state even further onto the capital gains roller coaster. Where did we bury that decision? In education! We keep nailing California school funding’s feet to the floor, then asking why we aren’t competitive nationally. Read the article. Twice. And still we won’t tackle the big problem–Prop 13.